Logo Grab is a spin off game from the hugely successful and immensely enjoyable The Logo Board Game (see our review of the original Logo board game here https://www.thetoyverdict.com/logo-board-game/). The basic premise is the inclusion of many famous brands and logos as gameplay content on the cards. The Logo Grab game is more of a .. 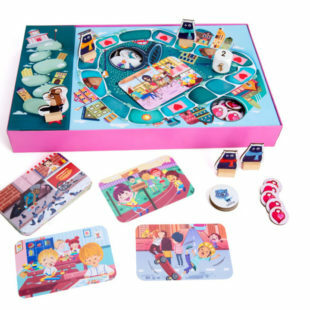 Logo Grab is a spin off game from the hugely successful and immensely enjoyable The Logo Board Game (see our review of the original Logo board game here https://www.thetoyverdict.com/logo-board-game/). The basic premise is the inclusion of many famous brands and logos as gameplay content on the cards. The Logo Grab game is more of a quick play format than the original featuring a single deck of 48 cards and 8 dice. It’s easy to learn how to play, and very quick to get into. The goal of the game is to be the first player to collect two different coloured sets of 3 cards (6 in total). The mechanic of the game works like this – lay out a grid of 9 cards (3×3), The cards show well known Logos from well known brands. Players take it in turn to roll the dice. On the dice are various letters, and once the dice land, players try to be the quickest to match a dice letter with a Logo card – so for instance if one of the dice has the letter ‘H’ on it, and if one of the cards is Heinz Beans, then a player could grab the dice showing ‘H’ while shouting out Heinz Beans. Then comes a little trick in the gameplay – if the dice the player picks up has a ringing bell in it, they actually lose one of their cards. if there is no bell in the dice then they can pick up the card they shouted out and add to their collection. Play continues until someone collects enough of the right cards to win. So in essence, this is a simple game with a basic but engaging game play pattern. We had fun playing the game, and we suspect the majority of people would quite enjoy it. Some people tend to think quicker than others, so there was a tendency for them to win more, but most games make it easier for certain people to win than others, so we don’t see this as a real problem. WHO’S IT FOR: We played with both family groups and adults. The box stipulates 8+ as the minimum age, and we tend to agree. THE TOY VERDICT: This is a good game. It’s quite good fun to play, quick and easy to understand.